Carrots have many health giving properties. However, the important thing to note is the selection of carrots, because many types of carrots. Choose a good quality is a dark yellow to orange, there are parts that do not rot and wither. Choose carrots are crisp, sweet, and does not contain a lot of fiber, fresh carrots (fresh or shortly after picking). Carrots contain a lot of beta-carotene, an average number of 12 000 IU per 100 grams of fruit. The amount is sufficient to meet the body every day at around 15000-25000 IU. Beta-carotene is an anti-oxidant that can be used to prevent cancer and delay the process of aging (wrinkles in the skin terutaman). Beta-carotene is a later addition in the liver is converted into vitamin A, useful to prevent night blindness, preventing xerophthalmia (dryness of the eye), stimulates the body to grow, repair kesuburuan, enhance immunity and others. In carrots also contain pectin, a type of fiber dissolves in water. Kind of fiber that can help lower cholesterol and blood sugar. In addition, carrots also contain water-insoluble fiber. Fiber is very beneficial for preventing gastrointestinal dysfunction such as constipation and colon cancer. Carrots raw or cooked first is a source of potassium and vitamin C. potassium content in carrots can help neutralize acids in the blood and its potent vitamin C as an antioxidant. Namely, prevent free radicals (as a result of the oxidation of LDL cholesterol) as one of the causes of degenerative diseases such as hypertension, stroke and heart failure. To obtain optimal efficacy, preferably carrot juice. one or two medium carrot juice can with a glass of water and drink every morning. The juice can be prepared with a blender and drink immediately because the active ingredient is important in the juice will disappear within 20 minutes after the blending process. That way, the health of the skin will remain intact. Skin looks smoother and less prone to acne. To further maximize the usefulness, carrot juice can be combined with some vegetables (cucumber, celery) or fruits (apples, tomatoes). 1. 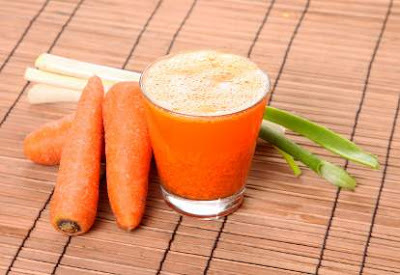 Carrot juice can overcome skin disorders such as black spots due to the aging process. In addition to vitamin A, carrot juice also contains vitamin E, which is useful for maintaining healthy skin. 2. Drinking carrot juice every morning before a meal can help digestion. High fiber content will facilitate the chapter and be able to absorb fat and toxins contained in the stomach. 4. The content of its high vitamin A will help cure night blindness sufferers. That was just a few of the benefits of carrot juice if we consume on a daily basis and many other benefits that may be too long if I write all here. Okay, let's stimulate a healthy lifestyle with the consumption of fruits and vegetables every day. Good luck.